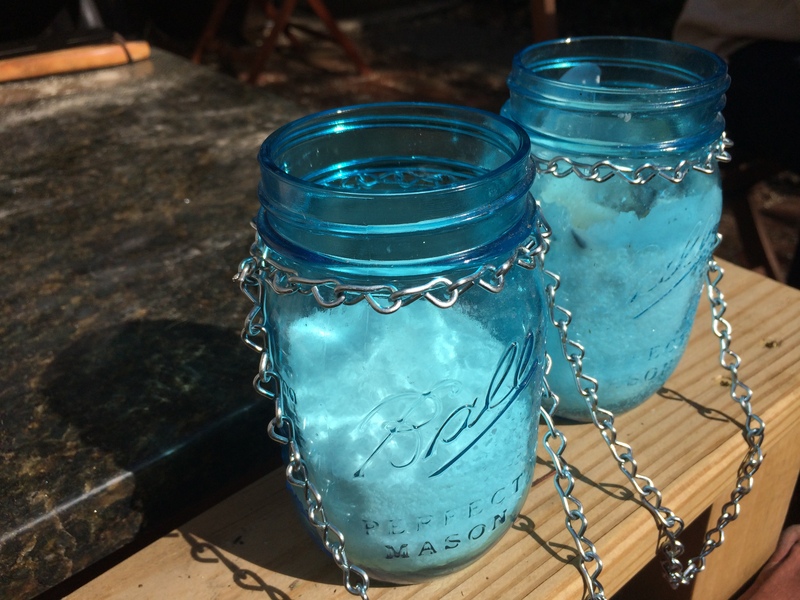 I am totally enamored with these beautiful blue mason jars from Ball. You may remember that I used them for gifting cookies to friends and family over the holiday. 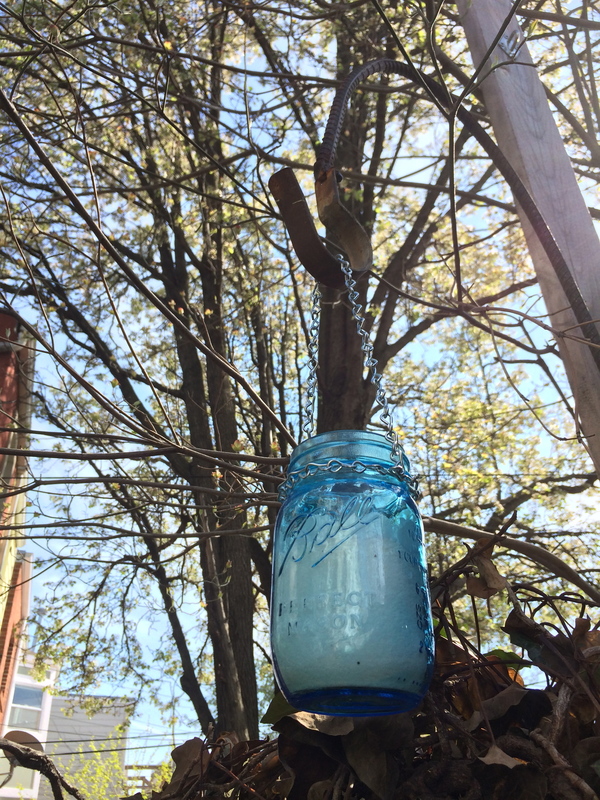 Now that the weather is *finally* warming up, I’ve turned them into lovely little hanging lanterns for my backyard. It’s super budget-friendly DIY Design project that any of you can do; here’s how! – Optional: Strong scissors (if pliers don’t cut wire). Fill your jars with enough salt to make it easy to reach the candles for placement and lighting. But make sure the salt level is low enough that the wick is beneath the top of jar. The whole point of the lantern is to keep the wick protected from the wind! I usually fill the jars about 2/3 of the way with salt. Cut a piece of wire that is 2-3 inches long. 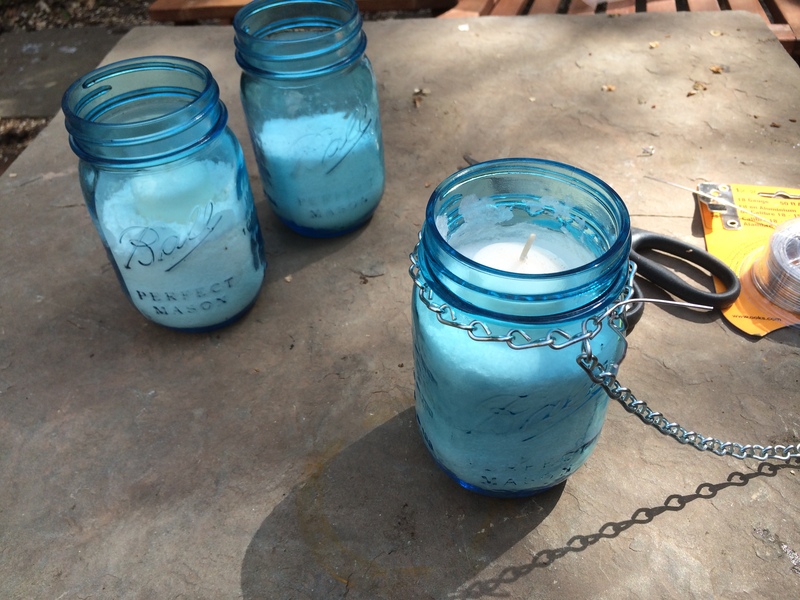 Take one of your 2-foot pieces of chain; starting with one end, loop it around the jar so it lays as flat as possible underneath the grooves at the top of the jar. 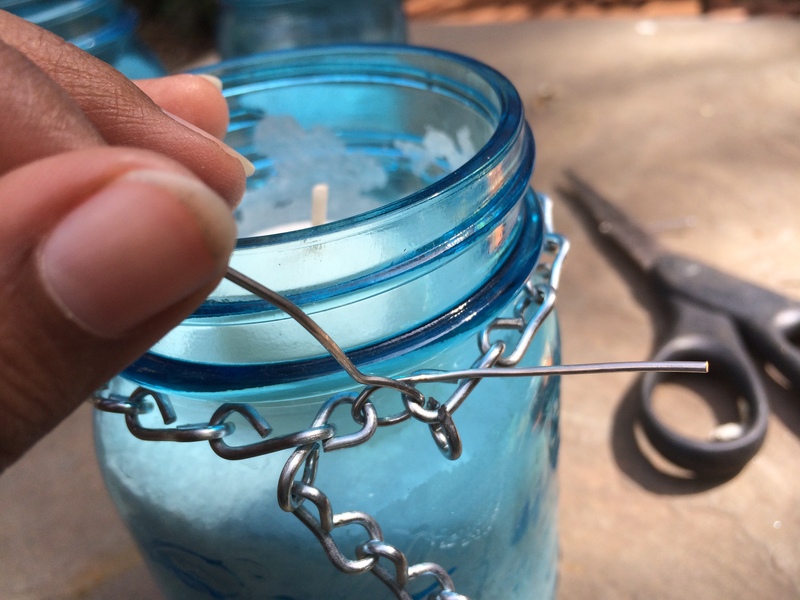 Then loop the piece of wire through the links so that the chain is hugging the jar very snugly, and twist once to secure tightly in place. Using your pliers, tighten the wire loop and then twist the ends tightly two or three times. Once the wire is twisted tightly into place, cut the excess length off of the wire. The little twisted link that you just made will blend right into the chain. Take the last link on the loose end of the chain and fasten it to the exact opposite side of the jar opening using the same technique described above, forming the loop that you will use to hang the jar. And that’s it! Hang from tree branches, a shepherd’s hook, your fence, or anything else that protrudes and is strong enough to securely hold these babies. It looks like fall has finally come to DC! (I think.) 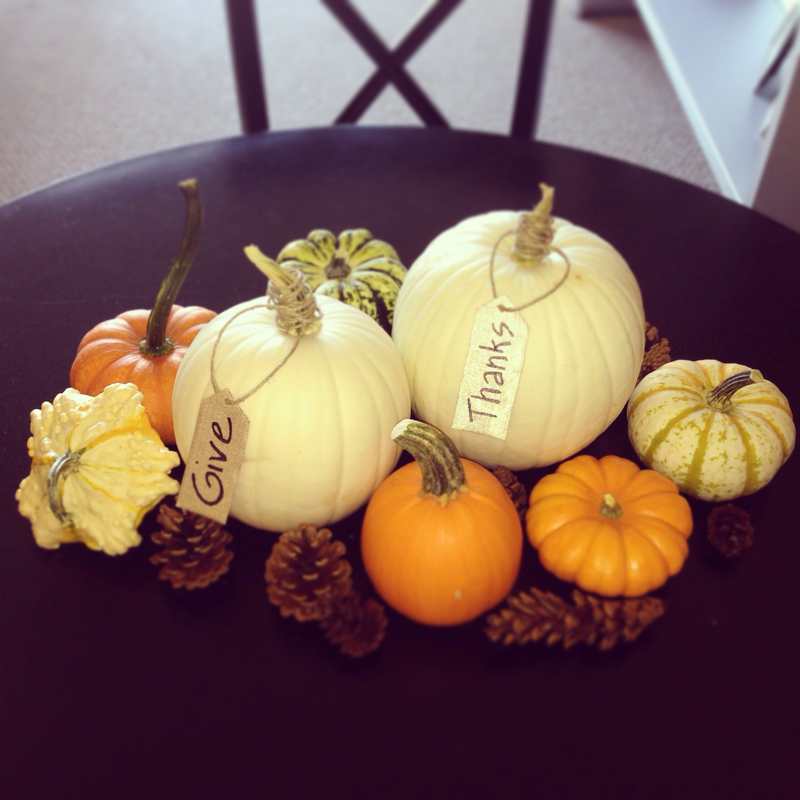 Adding a little seasonal flair to your home is a fun, cozy way to get in the spirit of things. 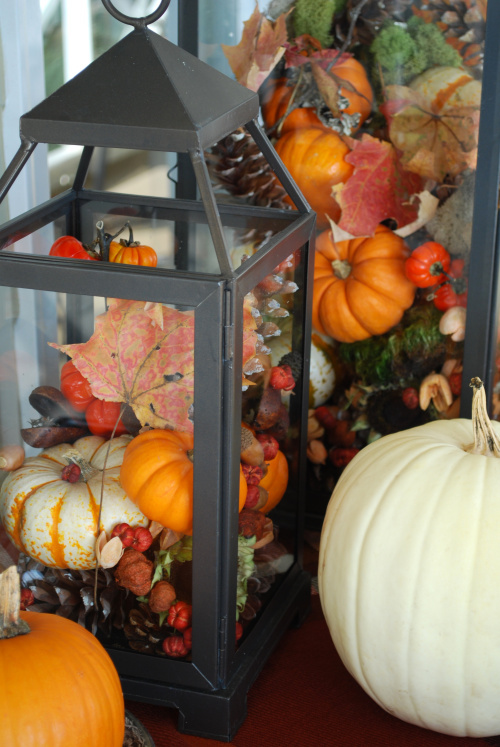 Here are some of my favorite decorating tips for celebrating my favorite season: fall! Once the leaves in your hood become fiery and brilliant, fill glass jars and/or vases with them instead of store-bought flowers. In addition to being a beautiful, seasonal, and hyper-local – they’re free! And no need to run to the store – just grab a few handfuls on your way home from work. 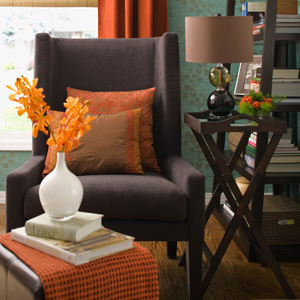 Changing up your decorative linens seasonally can be a great way to refresh your home’s look. And I’m not talking about changing your bedsheets (hopefully you’re doing that more than just seasonally!) Think throws, throw pillowcases, duvet covers, tablecloths, even napkins if you’re fancy enough to use cloth ones. These vases are a decorator’s dream. They come in all shapes and sizes, and are basically tall, cylindrical vases that are wide enough for you to fit stuff into. Candles, fruit, decorative rocks, flowers and foliage, teddy bears, pearls, whatever your creative lil mind desires. Changing them up seasonally is a snap. The lovely fall variation above features autumn leaves secured to pillar candles with jute string, all resting on a bed of popcorn kernels. Firelight automatically makes any room/space/activity cozy. Lanterns are a lovely way to add firelight to any setting, which is a plus now that it’s getting dark earlier. They also offer the added bonus of protecting clumsy hands from the open flame! Or, alternatively, they make great vessels for holding seasonal pieces of flair (see above). This time of year, your local farmer’s market will be chock-full of tiny, knobbly gourds that are perfect for adding fall flair. Fill a beautiful bowl or hurricane vase with them, tie them up into a wreath, hollow them out and use as a flower vase or candle-holder, or just pile them up in the center of your table or countertop. Voila!